Having grown up in Missouri on the outskirts of tornado alley, I have always been fascinated by both the storms that produce tornadoes, and of late, the people who put themselves in the path of these storms. No surprise, then, that I jumped at the chance to read Chris Kridler's novel about storm chasers. 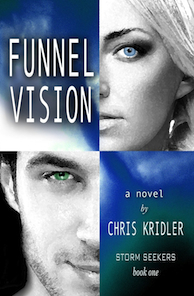 Although Funnel Vision is Ms. Kridler's debut novel, she is no stranger to writing. I am always interested to see how well an established journalist can transition to the world of fiction. In the case of this author, I would say her foray into fiction is a success on the whole. The book is both well written and well researched. You can certainly tell the the author understands all aspects of her subject. Her knowledge of both the science of the storms and the technology and science used by the storm chasers is excellent. Not being either a meteorologist or a storm chaser myself, though, I did find myself up to my eyeballs in terms that were unfamiliar to me at the beginning of the book. With the help of a dictionary and as the story progressed, though, I found this to be less and less of an issue. The strongest part of the book for me was the story of the storm chasers. As a storm chaser herself, the author was able to capture the passion, bordering on obsession, that storm chasers feel for the storms. I especially liked the way that she used her characters to showcase the various levels that passion. As a nature photographer myself, I found Judy's descriptions of the colors and visual manifestations of the storms was amazing. I was also mesmerized by Jack's obsession with the storms and being smack in the middle of things. And then there was Robinson, who excellently illustrated the middle ground between the two. Where the book fell a bit for me was in the stories of the characters personal lives. As others have said, I would have been totally happy if the romance part of the story line had been left out altogether. I will admit, I am not a romance reader in general. Therefore I appreciated the fact that the romantic elements of this story took backstage to the storm chasing story line. But, in fact, I would rather the author had spent the time discussing the backgrounds of the characters that led to their passion for storm chasing instead of just alluding to them. I felt the whole Jack-Shannon story line did not fit into the book at all. In general, though, I enjoyed this read, especially the last part of the book that mostly just dealt with storm chasing. For that reason, I am looking forward to reading the second book by this author,Tornado Pinball and I would give this book a solid 3 stars, maybe even 3.5.